Reverb is written for women, about a man so involved in his own genius, his career as a musician, he's not really paying attention to the people in his life. Beautiful, rich, talented, and desired by many, James Whren's only real passion is with his muse, inside his head, where so many men live. How do you get a man outside his head (his big, or little one)? It took James being sexually tortured in a mental institution in Scotland for thirteen months and being abandoned in hell with no one real to save him, to figure out he'd brought this nightmare on himself. It took another year, safely ensconced on the Greek island of Corfu, and the wisdom of Elisabeth and the unfettered trust of her year-old son, Cameron, to finally figure out that love is not a concept. It must be shown virtually daily with actions, like listening, really listening, questioning and caring outside of oneself. Romantic suspense is a relatively new genre, and seems a buzz phrase for anything with romance, and suspense in it. 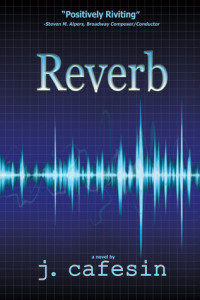 Reverb would have been called literary fiction in the past. It's told like Crime and Punishment—a modern, clean, fast-read. But it is raw, edgy, and to the point of sharp. Though James was imprisoned and tortured, the story begins after this event, when he's escaped and is on the run. Only glimpses of his incarceration are seen in quick flashbacks. A quick thank you to E.L. James for giving me permission with 50 Shades of Gray to write the book I wanted. This is the second version of Reverb, the first was rather tepid comparatively. Reverb is smart romantic suspense, with complex characters driven by the same feelings and flaws we all share. Told in three books, all in one novel, the story chronicles the journey of a modern man, from solipsist to integrated awareness. Inadvertently, he awakens his capacity to love.